Terre des hommes CORE Trust and Railway Children India (RCI) cooperate together for CCRS (Children in Contact at Railway Station) project since February 2017 at the railway station of Salem. 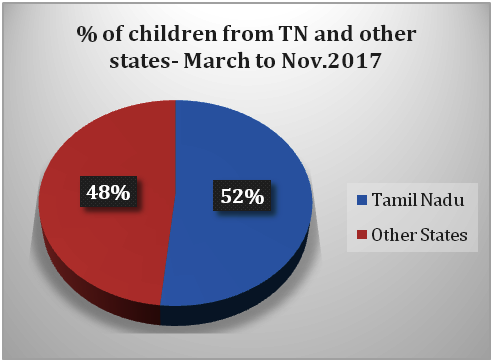 The project has the goal to identify children who arrive alone at Salem Railway Junction, and to Rescue, Restore and Rehabilitate them. Thus, we have strived to create child-friendly railway station and to build sustainable child protection mechanism at the station level. Salem is one of the major railway junctions of Tamil Nadu having approximately 50,000 foot falls in a day as per railways (Census 2011). Almost 182 trains from different parts of the country passes this junction every day. It is well connected with all parts of the country particularly to neighbouring states and districts. 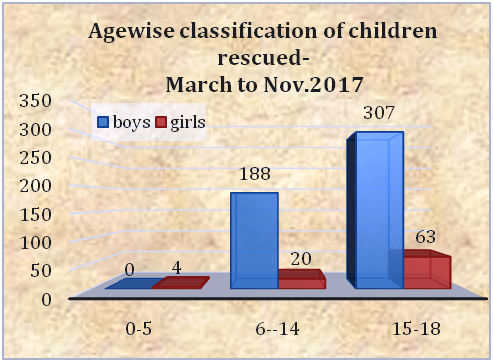 Let’s look the following charts and datas to have an idea about how many children we are rescuing from different countries and which age they have.